Just came back from our week vacation in Sicily, Italy. We looked forward to it for months, but vacations are always over in the blink of an eye, so after a night in my own bed I can't even imagine I was away for a week. 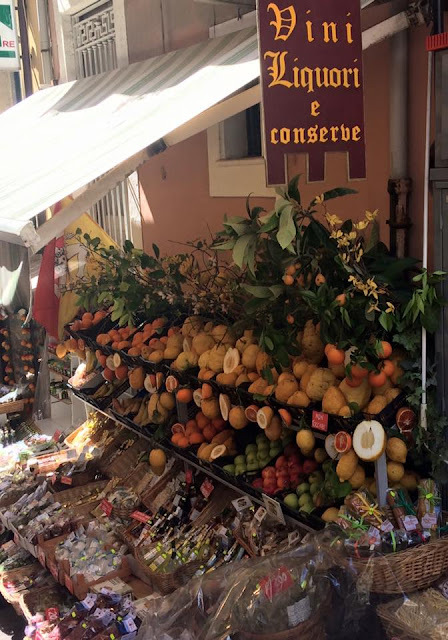 Sicily is beautiful, really beautiful, the food is in one word great, people are very friendly (far more than on the main land, in my opinion, but my opinion is based on just one other trip to Italy, to Florence and Pisa to be precise). All ingredients for a great little trip, but there was one big downer. Before we took the plane, we had hired a car on internet. We would arrive in the evening, so plans were we just had to pick it up at the airport and could drive to the house we had rented. In theory, that was. When we arrived, the car rental had canceled our booking, because our arrival time wasn't filled in. Although they had our flight schedule (which is what I would look at as I rented cars, because flights can be delayed), they just canceled it. In just a couple of days we will take off to Sicily. I hope temperatures will be a bit better than here, because it's rather cold around here. When summer approaches I always feel like making hippie-like clothes (very convenient when you like to crochet). Today I made bare foot sandals, so hope there will be at least one day we can go to the beach. Update: for you people who were expecting to see a picture of bare feet and crocheted sandals, I hope you weren't that disappointed. A couple of days before we left for Sicily my laptop broke down, so I couldn't post pictures, text, nothing. Hope you're still with me, because today, tadaaaaah, I'm back in business! With the picture! My Triangle Shawl was featured by Oombawka Design! Thank you so much, Rhondda! As said last week I would love to make the beautiful felt swan I found on Pinterest a while ago and although mine hasn't the dreamy beauty of the original one, I'm pretty content with my own swan. Too bad I couldn't find the speckled white tulle the designer of this swan used, because that makes it even more beautiful. Another idea that's on my boards for a while now, is this clay hand of fatima. For some reason it gives me a summery feeling. Would be nice to have some of them sitting around the garden with scented little candles in it. A while ago I saw this beautiful yarn from Durable, called Colourful. They had a great color combination with glaucus, gray and black, so the purchase was made very fast. Today I finally finished the shawl. 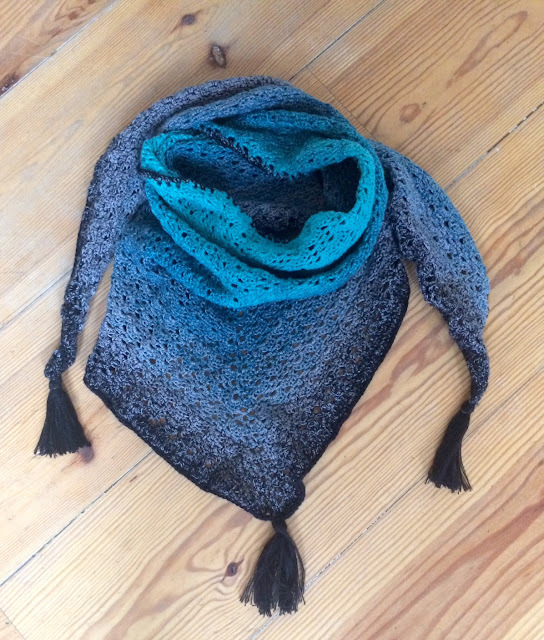 The result is beautiful, I think, but making the shawl required all the patience I had in me, because I had to unravel the yarn all the time. It's made of four loose strings (not twined), and to get a nice turnover in colors one of the strings changes color after several meters, then another one turns color and so on. But in my hands one or two of the strings were pushed forward the whole time, so they became uneven and every now and then I had to cut of the strings because they were so entangled. But...., now that it's finished I really love the result!! When I was a child, in the village where I grew up were two schools. One was for Catholics, the other one was a public school, for all other kids. Kindergarten classes were all in the same building and maybe that was the reason the public school kids also decorated a cross for Palm Sunday. After the crafting part all kids together went in a sort of procession through our village with the crosses. Since Kindergarten I never saw decorated crosses again, but I thought it was nice to make them with my daughters last week. 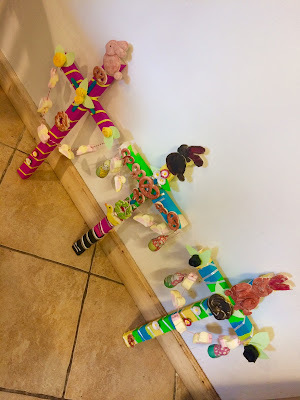 So my husband made three crosses, we made figures from salt dough and decorated the crosses with the figures, chocolate eggs and crepe paper. Do you know about this tradition for kids? Of course I know about the great processions, especially in Spain, but beside in my own village, I've never seen them for kids. And here's the octopus I made for my colleague's baby. I used other colors and gave its face another expression, but it's the same free pattern as shared with you last week. Another pin I can scrape off of my boards. A while ago I saw this picture of a beautiful swan on Pinterest. It didn't come with a tutorial or a pattern, but I want to give it a try to imitate this one. It looks a bit dreamy and fairy tale-like, don't you think? I just love it! 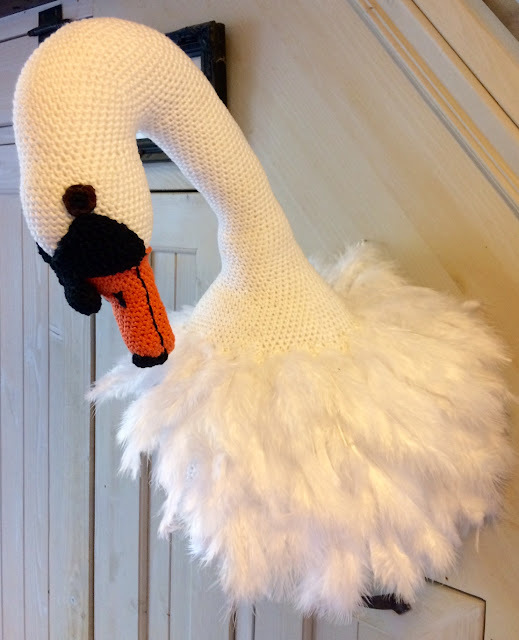 For my daughter's birthday I found a great idea: a crochet swan trophy head. So I bought the pattern book, written by Vanessa Mooncie, bought yarn and started to crochet. I've made something from a book by Vanessa Mooncie before (maybe you remember this flamingo) and although I consider myself an advanced crocheter, I found her patterns a bit difficult to read. But in the end I had all necessary pieces and could put them together. Unfortunately the piece of feathers was much too small for the swan's body and because I didn't feel to start all over again, I made something up. 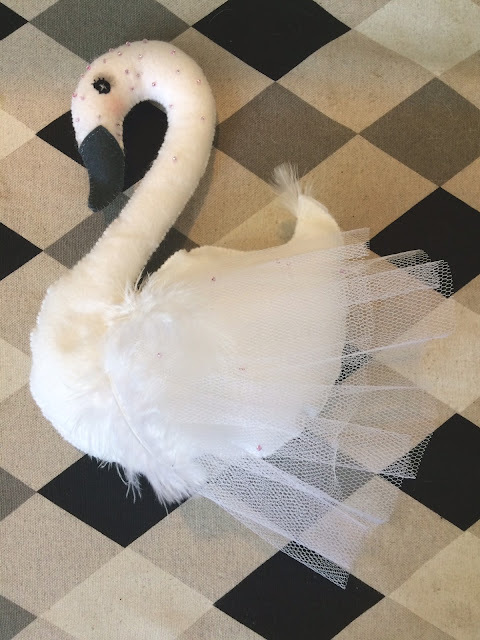 Instead of making a new, larger piece of feathers (crocheting the feathers I found taking the most time to make), I bought white feathers in the craft store and attached them one by one to the swan's body. Also quite a job, but it takes less time than crochet. Here's the result. 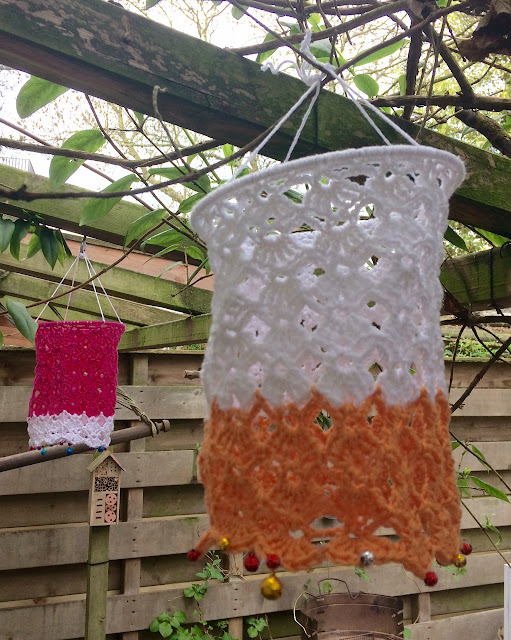 The last couple of weeks I see crocheted lanterns everywhere and since I had a pattern on my Pinterest boards, I thought it would be nice to make two of them, now that garden days are upcoming. Tomorrow it will be around 20 degrees Celsius around here, so they're finished just in time to decorate our garden while we are bbq-ing. The Unicorn Cupcakes that my daughters made, were featured by City of Creative Dreams! They're so proud to be chosen! Thank you so much, Shanice! The Stroller Toy is also featured! Thanks, Sara from Creative Jewish Mom, Pam from Threading My Way, Anna from Strawberry Butterscotch and Ali Rose from Two Chicks and a Mom! 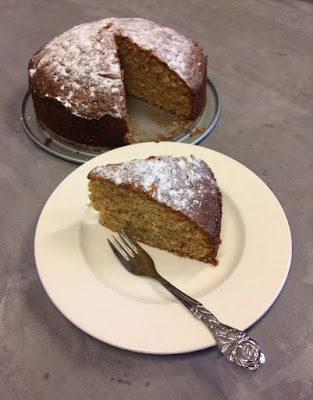 Last week I shared the recipe for a Hazelnut Sponge Cake with you. What I like most about the recipe, is that there isn't any chocolate in it, because I think that makes it taste like Nutella and I wanted to have the pure hazelnut taste. The recipe was just as good as I hoped it was! Well, better yet! 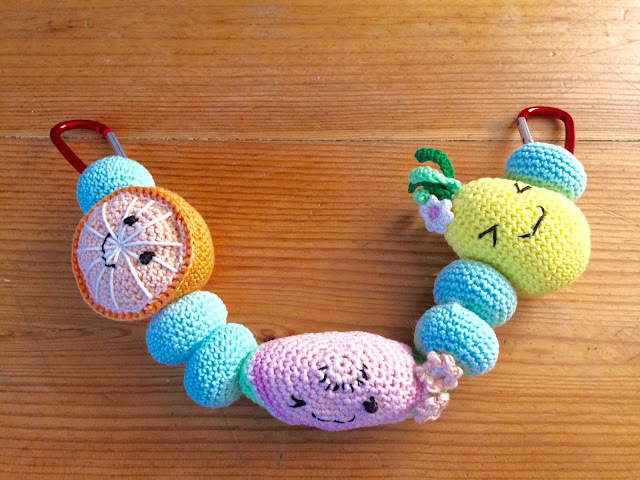 One of my colleagues asked me to make a little octopus for her baby. On my Pinterest boards I had pinned one as a part of different sea creatures, so I want to use that pattern for this little project. My daughters almost have vacation once again and we have planned a short trip to Sicily. It's an island belonging to Italy, as most of you probably know from movies like The Godfather. And if you don't know these movies (there are three of them, actually) I would highly recommend them. It was on our list for quite some time. The last couple of years we planned trips in the direction of the equator in spring or fall, because summers are just too hot nowadays towards the south. In the summer we rent a house somewhere in the country we live in (The Netherlands, which is a bit more northern). Much better, temperature wise. Anyway, when it comes to vacation trips, I think a lot of fun comes from planning beforehand. Besides reading about nice places to visit (but what can beat the sight of Mount Etna, erupting this moment, now, as we speak! ), I thought it would be nice to cook some local dishes. 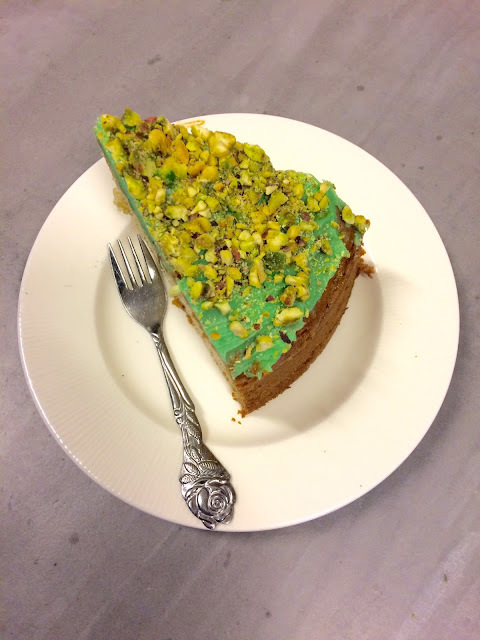 One of them is a pistachio cake. This week there's a baby shower I have to visit, for the wife of my husband's cousin (do you follow?) and besides a store bought cute little dress, I made this stroller toy for the baby girl.